For customers who are off the utility grid by choice or necessity, generators designed for off-grid usage provide seamless operation and renewable backup. Homeowners with solar collectors on their roof enjoy taking power into their own hands, knowing they’re not dependent on the electric utility to keep the lights on and the refrigerator cold. But what happens if their PV system can’t keep up with the home’s electric demand or if backup grid power goes down in a storm or blackout? Then the onsite system’s battery banks can be depleted, leaving the owners in no better position than their utility-tapping neighbors. What’s your renewable-energy-minded customer to do? Enter propane-powered generators that work in off-grid applications. In recent years, companies such as Kohler and Generac Power Systems have introduced generators that make off-grid homes more resilient in the face of outages, which were widespread in some parts of the country during the recent hurricane season. Generac’s EcoGen unit, for example, can be hooked into a PV or wind turbine system to charge the batteries while also temporarily providing power to the home. Here’s how it works: When there is a power outage — or the sun isn’t shining or the wind isn’t blowing — the batteries in a PV or wind turbine system can drain. When the batteries fall below an acceptable level, the EcoGen will turn on, providing power to the home while also charging the batteries. Once the batteries are charged, the inverter signals the generator to turn off. This cycle continues until the renewable energy sources start storing power again, says Jake Van Wormer, product manager at Generac. Generac recently added Wi-Fi connectivity via a Mobile Link app that allows homeowners to view real-time generator status, maintenance information, and the dealer contact. “With Generac’s optional liquid propane tank [monitor], users can also track their propane tank levels via Wi-Fi,” Van Wormer says. Propane is being used to fuel off-grid generators in more dire circumstances, too. After the Tubbs wildfire in Santa Rosa, California, melted the area’s electrical lines, many homes had to rely on propane- or diesel-fueled prime generators, which are used as a primary power source and not just for standby or backup power. “The house survived, or the owners are living in the guest house or barn and using prime power generators until the electrical services are back,” says Liesl Ramsay, CEO of Leete Generators in Santa Rosa. Demand for off-grid generators also comes from the company’s Bay Area customers who are moving into a newly built home and don’t yet have utility service — which can be costly. “They decide to go on a prime generator for a while,” Ramsay says. “But then they get a quote to run power to the house, and the price goes up, and soon they are living off the prime generator” indefinitely, she says. Some of Leete’s customers have paid anywhere from $10,000 to $200,000 to get electrical hookup. “We have kind of seen it all,” Ramsay says. What should builders look for when specifying a generator for an off-grid installation? “Maintenance and total cost of ownership are two big factors to consider,” Van Wormer says. “Off-grid generators should be able to provide hundreds of hours of backup power before being serviced due to their important role and potential amount of use.” The Generac EcoGen unit, for example, offers 500-hour maintenance intervals, which also leads to lower operating costs. Two other important considerations are local air-quality and noise-control regulations. California has the strictest standards. “We have noise regulations at the property line that are very stringent,” Ramsay says. Because regulations vary by jurisdiction and application, one unit doesn’t fit all, she says. Whether your customers are living off-grid by choice or by chance, backup power is more important than ever, given the number of people who like to generate their own alternative power and the spike in extreme weather events in the last decade. 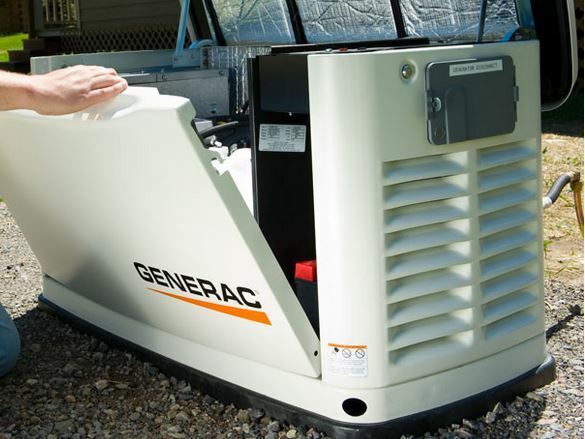 Having the right propane- or gas-powered generator will help them go about business as usual.